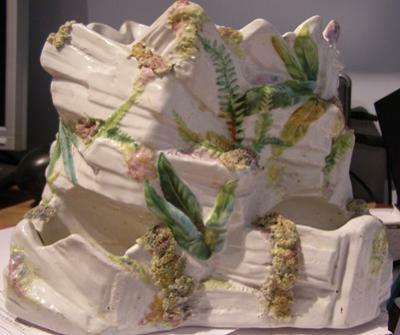 Early Royal Worcester Vase Resembling a Rocky Outcrop? 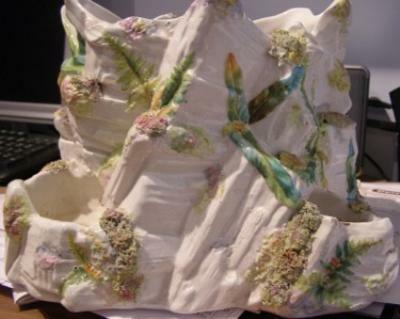 This is a large, white glazed vase possibly a Royal Worcester vase in the form of a rough rocky outcrop. The vase has four recesses around the base and it belonged to my mother-in-law who lived in Wraysbury, then Staines. Her father used to go to a large house locally and buy objects from sales, but she couldn’t remember where the house was. 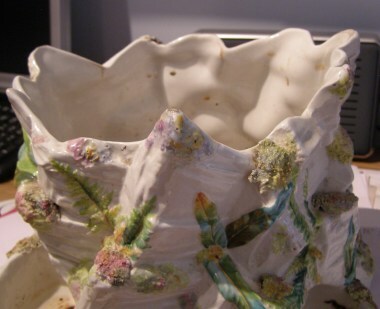 The Worcester vase is white glazed, about 24cm across and the base is roughly square. The top aperture is 17 cm x 20 cm and the top edge is not straight but jagged. ie; it is very wide for a vase. Around the base, there are four recesses for more flowers, with round holes to allow water from the main chamber to fill the recesses. It has leaves and ferns handpainted on it, as if growing out of the rock, and finely moulded lichen, again hand painted, dripping down from various ledges. 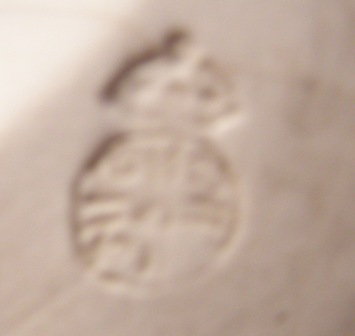 The ‘Worcester’ mark looks like a crown upon an orb and the closest I have found is the Royal Worcester mark, but there is no W in the orb. Actually the crown looks like a pie with a cherry on it. Any information anyone can offer would be very helpful.